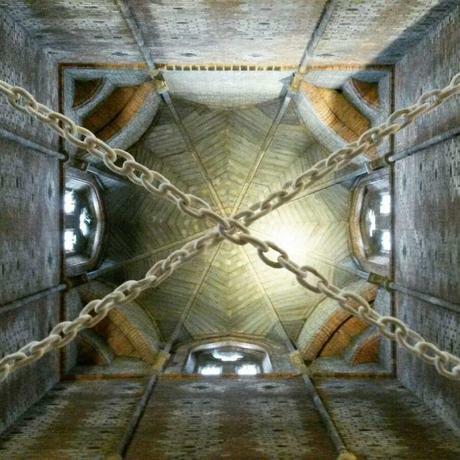 the battle of free will is a coincidental fit to ceramic artist william martin latest installation ‘ARCH’ at the florence trust in highbury, london, consisting of two porcelain chains more than 8 meters in length, suspended beneath the tower of the church of st. saviours. while initially the connection may veer dangerously close to the predictable, i rather believe it a poignant part of the archetypal narrative which is beyond religious confinement. 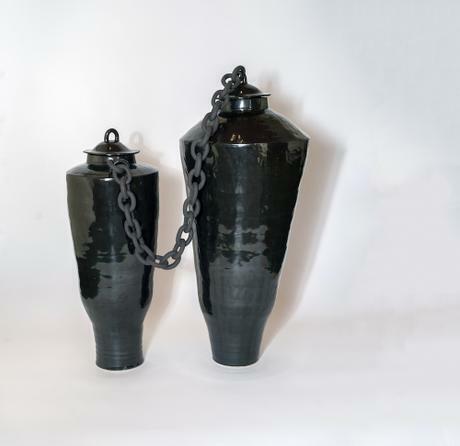 it also has to be read in the context of the artists other works which shows a continuation of his fascination with chains. the subtext of fragility in the medium further investigates the nature of our ideas pertaining to social or physical structures and comments on their inherent dichotomous qualities; the chains which bind us may also be the chains which keep us from falling apart. this perspective is raised in ambrose bierce’s ‘ashes of the beacon’ and becomes a relevant translation of our relationship to order and chaos. the habit of obedience to written law… will persist for a long time, with an ever lessening power upon the imagination of the people; but there comes a time when the tradition is forgotten and the delusion exhausted. when men perceive that nothing is restraining them but their consent to be restrained, then at last there is nothing to obstruct the free play of that selfishness which is the dominant characteristic and fundamental motive of human nature and human action respectively. the list of associations conjured up by chains reveals its ambiguity which is what i am most attracted to; both as an object and as a construct. a case in point is another work; ‘dependence’ from the velorose gallery, here william explores these associations with a strong existential undertone; an unpair of dark gloss glazed lidded vessels are connected with a matt chain, their silhouettes impose a reflective figurative element and dares to question the viewer’s personal perspective; a relationship bound by a smokey dependence of similar but unequal identities; dominance or mentorship, idolatry or subservience, addiction or slavery, freedom or desire, love or reliance? william martin has picked a perfect time to confront us with our conflicts; when the vulnerable connections between liberties and rights are becoming increasingly fragile and our social structures precariously top-heavy.